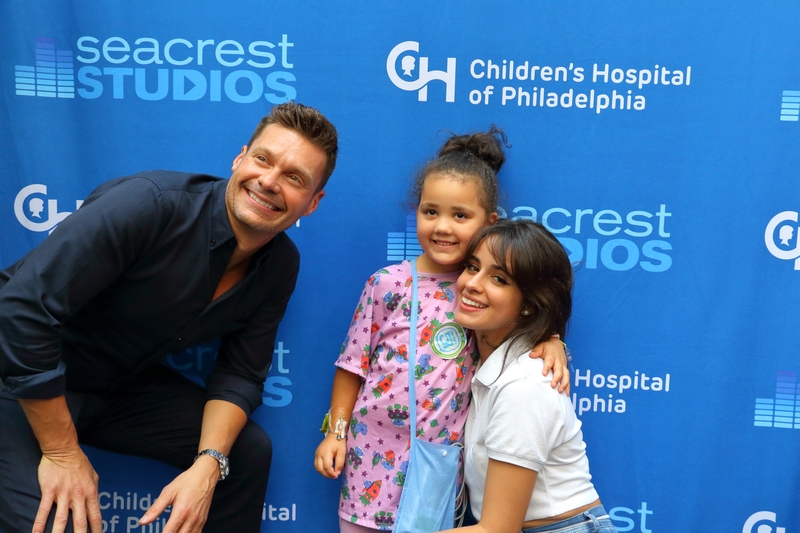 LIVE in Seacrest Studios at Children's Hospital of Philadelphia with Ryan Seacrest and Camila Cabello! It was nothing but high-fives, handshakes and hugs when Ryan walked in- but it didn’t stop there. He surprised everyone in the hospital with a special guest. People gathered all over the Atrium and studio space while some even looked down from their hospital rooms to see Ryan Seacrest stand in the very studio many patients benefit from every day. And running into the studio behind him was his surprise guest, singer-songwriter Camila Cabello! Camila LOVES Disney movies! She was so happy to be in a setting with so many kids who shared the same passion for Disney as she. Her favorites are Tangled and Hercules. Her favorite snacks are Oreos, Kit-Kats, and chocolate (“dark chocolate, of course!”). She even keeps all of these in her dressing room! Her absolute favorite part of being on tour is that she can finally express herself! She can be Camila Cabello on and off stage and staying true to herself is extremely important. She loves being around music all the time. She has liked music ever since she could remember. Did you know that Camila’s song, “Havana” is the most streamed song of all time? And the artist was in our very own Seacrest Studios! Camila was performing in Taylor’s Reputation Stadium Tour that very night in Philadelphia! Many of our patients and families even had tickets. They left their photo-op with Ryan and Camila by saying, “See you later, Camila!” How many people can say they told a pop-star, “see you later!”? After the interview, Ryan and Camila took pictures and signed autographs for patients and their families. Before we all knew it, it was time for them to go! The phrase “time flies when you’re having fun” could not be truer when it comes to being in Seacrest Studios. Thank you, Ryan and Camila, for such an amazing experience!